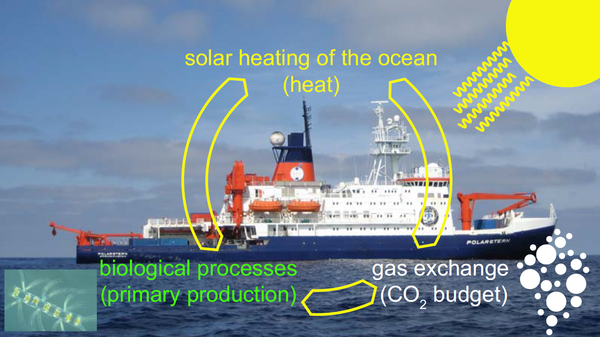 Within the OCEANET project the first shipborne facility was developed that is able to investigate continuously the transfer of energy and material between ocean and atmosphere. The facility is based on the expertise of the Helmholtz Centre for Ocean Research Kiel (GEOMAR), TROPOS, the Helmholtz Centre Geesthacht, and the Alfred Wegener Institute (AWI), Bremerhaven. State-of-the-art oceanic underway measurement systems observe the CO2 and O2 concentrations, type of plankton, temperature, salinity, nutrients, and turbidity to determine the state of the upper ocean. Continuous observations of aerosol, cloud, temperature, and humidity profiles, liquid-water path, solar and thermal radiation, sensible and latent heat are performed to determine the influence of the highly variable atmosphere on the energy budget between ocean and atmosphere. Additional satellite observations by Meteosat Second Generation (MSG) are used to estimate the radiative energy budget at the top of atmosphere (TOA). OCEANET is currently operated aboard the German research vessel Polarstern during its meridional cruises to the southern hemisphere and back. TROPOS contributes to OCEANET by the measurement of atmospheric properties above the Ocean surface. The first Polarstern-cruise of OCEANET took place in October 2009. Since then, TROPOS has been participating regularly in the meridional cruises of Polarstern to the southern hemisphere. The equipment provided by TROPOS comprises in-situ and remote-sensing components. The OCEANET-Atmosphere facility was developed to cover the atmospheric observations aboard Polarstern. All measurement instruments are mounted on a 20-feet container shown in Fig. 2. Incident solar and thermal radiation are measured with a pyranometer (CMP21) and a pyrgeometer (CGR4), respectively, from Kipp & Zonen (box c in Fig. 2). They are part of the SCalable Automatic Weather Station (SCAWS), which was developed in cooperation with the German Meteorological Service (DWD). Due to the additional recording of temperature, relative humidity, and wind (box a in Fig. 2), OCEANET-Atmosphere became an official DWD station. Box d in Fig. 2.4 shows the instrumentation for turbulence and CO2 flux measurements enables the determination of sensible and latent heat fluxes. Every 15 s a sky imager (box e) takes a picture of the hemisphere above the platform to estimate cloud coverage and cloud type. Liquid-water path is calculated from the measurements of the Humidity And Temperature PROfiler (HATPRO) for further cloud investigations (box f). Vertical aerosol and cloud profiling is performed with the multiwavelength Raman and polarization lidar PollyXT. The lidar is mounted inside OCEANET-Atmosphere container and measures through quartz plates in the roof. 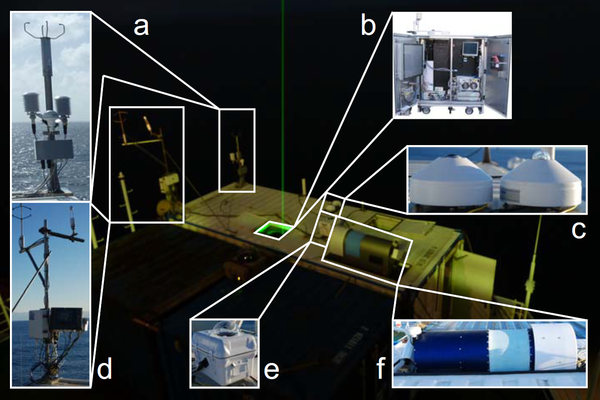 The emitted visible green laser light can be seen in the nighttime photograph of the container in Fig. 2. OCEANET-Atmosphere was deployed at the upperdeck, starboard of Polarstern at about 22 m above sea level.